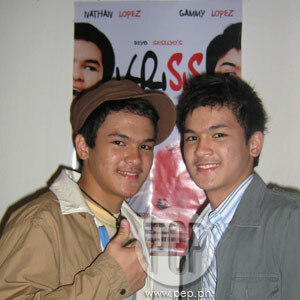 Nathan and Gammy Lopez share the same love in "Krisis"
Nathan (left) and Gammy (right) Lopez are tapped to play identical twins in the short film Krisis. This is Nathan's second time to portray a homosexual while this is a first for Gammy. Krisis is directed by Dave Cecilio (not in photo). Research shows that identical twins can feel what is happening to the other twin 50 percent of the time, while fraternal twins are able to feel empathy only 30 percent of the time. This is the basis of the 15-minute short film Krisis, which is directed by Dave Cecilio, and stars identical twins Nathan and Gammy Lopez. The young boys were part of two notable Auraeus Solito films in the past—Nathan had the title role in Ang Pagdadalaga ni Maximo Oliveros while Gammy was one of the scholars in the Cinemalaya 2007 entry Pisay. Like Maximo Oliveros, Krisis is also a coming-of-age short film but it highlights the emotional development of identical twins who have developed a liking for the same guy, their athletic classmate named Martin (played by Lucky Mercado). Last Sunday, March 9, Dave Cecilio invited PEP (Philippine Entertainment Portal) to the exclusive screening of Krisis at Via Mare restaurant, Greenbelt 1, Makati City. The intimate dinner was attended by the cast members, producer Terrence Lotosa, and the Lopez family (including the four sisters of the twins). Direk Dave showed the director's cut of Krisis, a short narrative film based on true-to-life experiences that have been fictionalized to protect the identity of the main informant. "In Krisis, hindi yung pagkakaroon ng identity crisis yung problema dito. It's the acceptance," he explained. "Matatanggap ba [ng pamilya] kung malaman nilang bading yung kambal? Sana kung isa lang, kaya lang dalawa sila." "The tagline here is: They shared the same egg, they came from the same womb, would they share the same love? Saka minsan, ang gusto ng isang twin, gusto rin ng isa," he pointed out. This explains why the characters of Nathan and Gammy fall in love with the same guy. According to studies of Michael Bailey, Ph.D., associate professor of psychology at Northwestern University, sexual orientation is under genetic influence, though not solely. In one study, he stated that if one identical twin is gay, the other is also gay 50 percent of the time. Aside from showing the close bond between twins, Krisis also portrays the identity crisis being faced by those in the upper classes of society. "Bakit puro ang palabas sa sine tungkol sa kabadingan sa poverty level. Let's change, ipakita naman natin yung sa mayayaman," said Dave. "Ang pagiging gay, walang pinipiling status sa buhay. You can be gay in a poor family, you can be a gay in a rich family. Ang importante, how are they being accepted in society?" It is interesting to note that in the closing credits, Dave dedicated this short film to veteran entertainment writer Atty. Billy Balbastro, who died of lung cancer last February 2. He was Dave's mentor in the showbiz industry. "Itong Krisis ang last film na na-feature niya sa column niya [sa Abante]. Umiiyak ako sa wake niya, ‘bakit ganoon, bakit hindi mo pa nahintay ang Krisis.'" DISTINCT TWINS. Produced by Cinergy Film Productions, Krisis tells the story of identical twins Peter (Nathan) and Paul (Gammy) who have distinct personalities but have developed the same feelings for their classmate Martin (Lucky). Peter is an extrovert and uses his left hand to write. He is part of the school's theater guild. Paul, on the other hand, is right-handed and an introvert. He prefers to be active in the glee club where he sings as a tenor. While studying at the school's library, the twins have their own way of showing their admiration for the handsome go-kart driver Martin. When PEP asked the young boys if they had any hesitations about accepting the role of homosexual twins, Nathan answered candidly, "Ang story niya kasi bading din [like Maximo Oliveros]. Dapat hindi ako papayag pero sinabi naman ni Papa na hindi siya physically bading. May identity crisis yung characters, hindi mo alam kung magbibinata sila o magdadalaga. Hindi naman kailangan mag-act like a bading. Mas ipapakita yung emotions." For his part, Gammy was excited and challenged to tackle this new role. "In-explain naman kung anong kalalabasan, kung anong mangyayari doon sa story." When asked to describe their dream roles, Gammy said that he hopes to make a horror/action/suspense movie. Nathan, who is older by ten minutes, said, "Sana magkaroon kami ng movie na lagi kaming magkasama." The two young boys are incoming senior high school students this June. In college, Gammy wants to take up either Fine Arts or Political Science while Nathan is interested in taking up Theater Arts or a film course. Dave Cecilio has submitted Krisis in the short film category of the 2008 Cinemalaya Philippine Independent Film Festival. The director is also set to shoot another short film titled Ang Sakristan on Bantayan Island, Cebu.